Would you like to learn how to build a successful and effective functional medicine practice? Are you getting the results you want with your patients? Would you like to work fewer hours and have more time off to pursue what you love to do? Are you tired of taking functional medicine courses that don’t deliver? I’ve been practicing functional medicine in the trenches for nearly 15 years and I’m now excited to teach exceptional, motivated practitioners all they need to know to build a successful and highly effective practice. I’d like to emphasize “highly effective” because that is the real key to building the practice you have always wanted. I’ve worked with patients in 43 states and 23 foreign countries with a 98% success rate. I’m ready to share – with an exclusive group of apprentices – all of the marketing techniques and patient management strategies that got me to this point. I’ve given this a lot of thought and the best way to help practitioners is through a true apprenticeship program that takes you from start to finish. 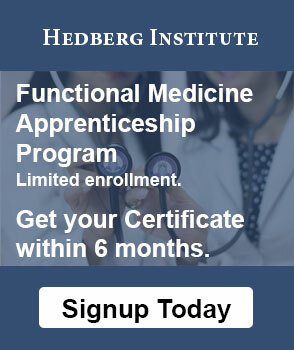 You’ll graduate from the program with a Hedberg Institute Certificate, totally confident and ready to work with any patient that crosses your path. *These materials are a $3,500 value. ~ Dr. Raymond Higby, D.C. The apprenticeship is by application and invitation only. Once you complete the application, we’ll schedule a short call and discuss if the apprenticeship program is right for you. Yes, and we can discuss this during our initial phone call. “I really wish I had access to a program like this one when I was just starting out. I also needed a program like this when I was struggling to take my practice to the next level. I’ve decided to create a program that I wish existed at both junctures in my own practice evolution. The cost of this program is a fraction of what I spent self-educating, and you’re saving thousands of hours of your own time. That’s because I’ve already done all the grunt work for you, and in the Hedberg Institute FM Apprenticeship, you are getting the benefit of all the education and wisdom that I bring to the table. You don’t have to spend your precious time and money on learning all of the essential patient, practice, and business elements we were never taught in school.